We have had a very busy month in An Comhar 1. We have been learning about people who help us this month. 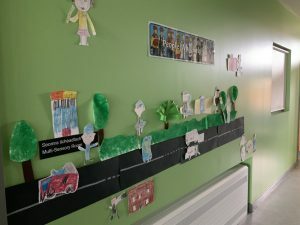 We talked about lots of jobs in our commun ity and the children discussed what they would like to be when they grow up. Some of the children would like to be firemen and others would like to work in Century Cinema. We really used our imaginations and came up with some wonderful ideas about what we would like to do when we are older! As part of our learning the children drew their own town and drew buildings and people to include in a class display. 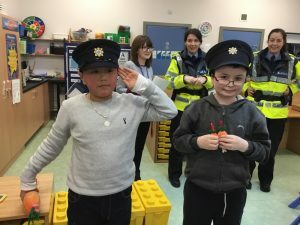 We made firemen, Gardaí, baristas, cinema ushers, nurses, doctors and a teacher. The children l earned about the roles and responsibilities of some of the jobs we talked about and we set up a medical centre in our classroom so that the children could pretend to be doctors. We had great fun taking temperatures, listening to hearts and of course giving everyone the flu shot! Ouch! 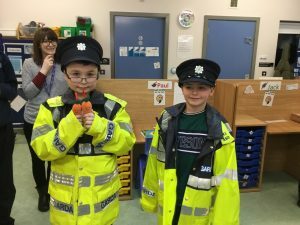 Last week we had a visit from the Gardaí! We were very excited! Annmarie and Maeve came to visit us and told us all about their jobs. 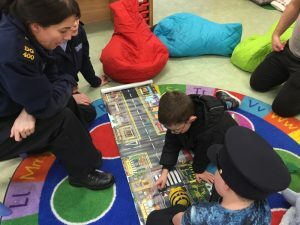 Maeve said that their job is to help people and explained to the children that if they are ever lost then it is safe to ask one of the Gardaí for help. 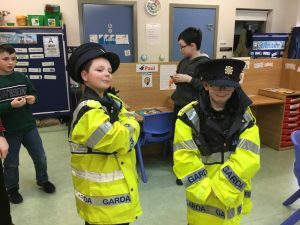 We got to try on the Garda hats and jackets and we looked like real Gardaí. We taught Maeve and Annmarie how to use BeeBots and they were very impressed with our knowledge of coding. We showed them how to take the Bee Bot on a trip around the community. BeeBot visited the playground, the shop and even went into the Travel Agent to book a holiday! We got to go outside and get into the Garda van and we even got to see the blue flashing lights on the outside of the van. It was a very exciting visit and Maeve and Annmarie gave us some colouring sheets when they were leaving. We really enjoyed the visit. We have been working very hard and putting lots of effort into all of our activities. We have had a great month in An Comhar 1 and we are really looking forward to new adventures in learning in February!